The only full-plate image of its type known to exist by this dealer. 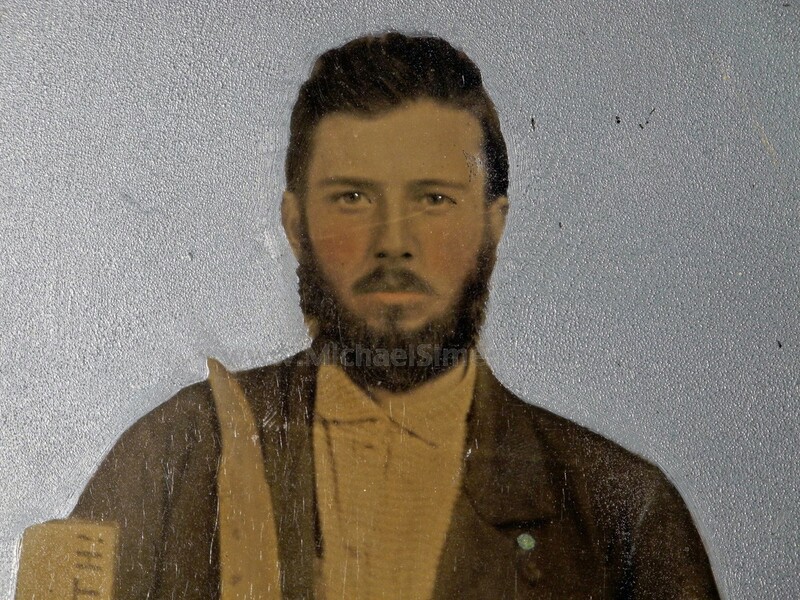 This is a rare, full-plate tintype image of a Confederate Soldier. 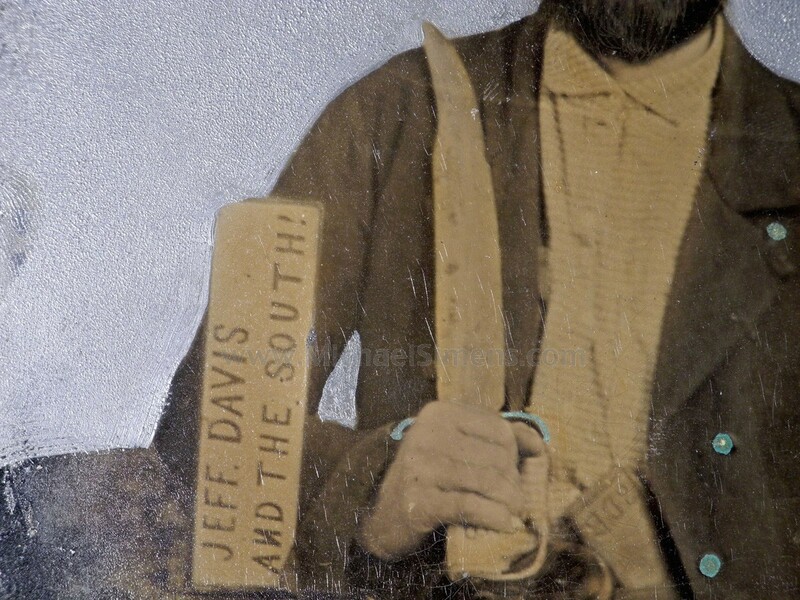 He sits armed and alert next to a table that is set with the familiar vertical card that reads "JEFF DAVIS AND THE SOUTH". 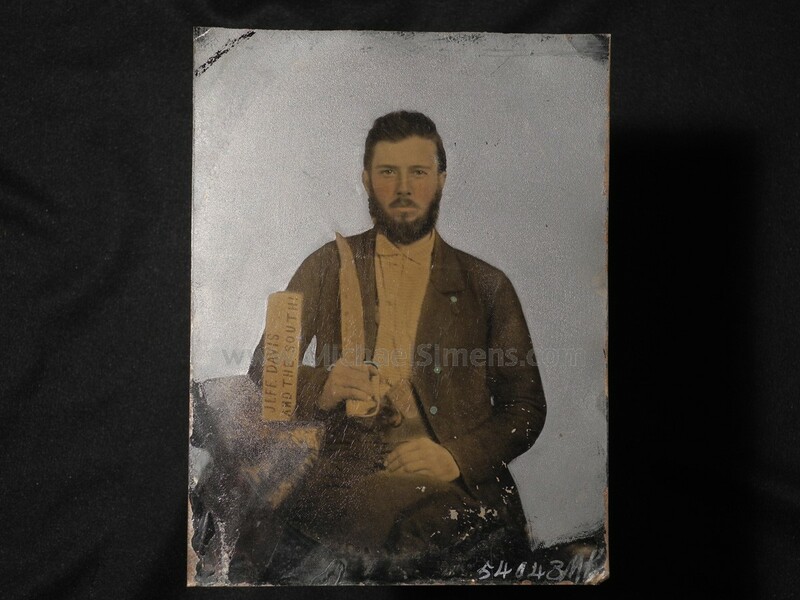 Holding a large D-Guard Bowie Knife sporting a huge clip-point with a Derringer style single-shot pistol in his belt, this is the largest image of its type ever discovered, a full-plate of 8&1/2 by 6&1/2 inches. 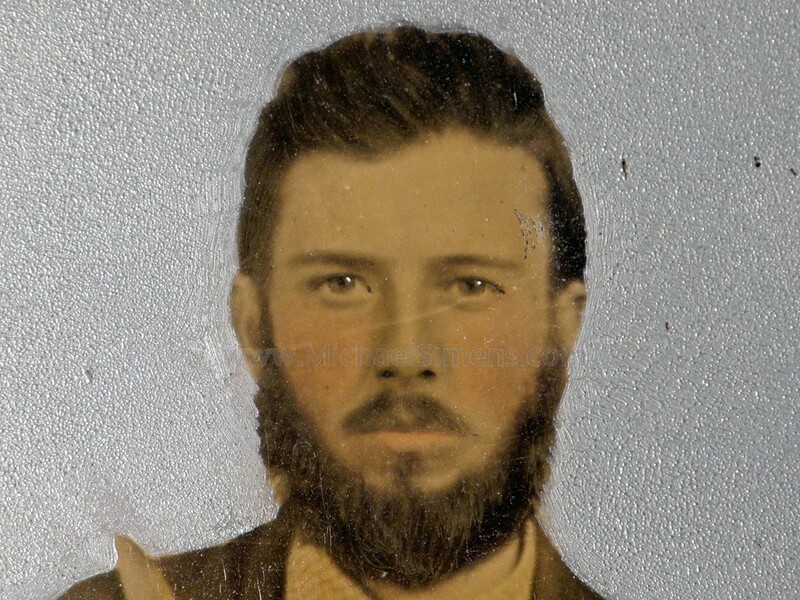 This is probably a wartime or post-war copy taken from an original ambrotype, but it is 19th century and as rare as any image I have ever seen. This is the 4th such image I have owned, with the others being tiny 9th-plates. I have heard there have been sixth or quarter-plates found in the past, but I have never seen one. Probably its most interesting feature are initials carved into the cover of the bible or small book also tucked in his belt. 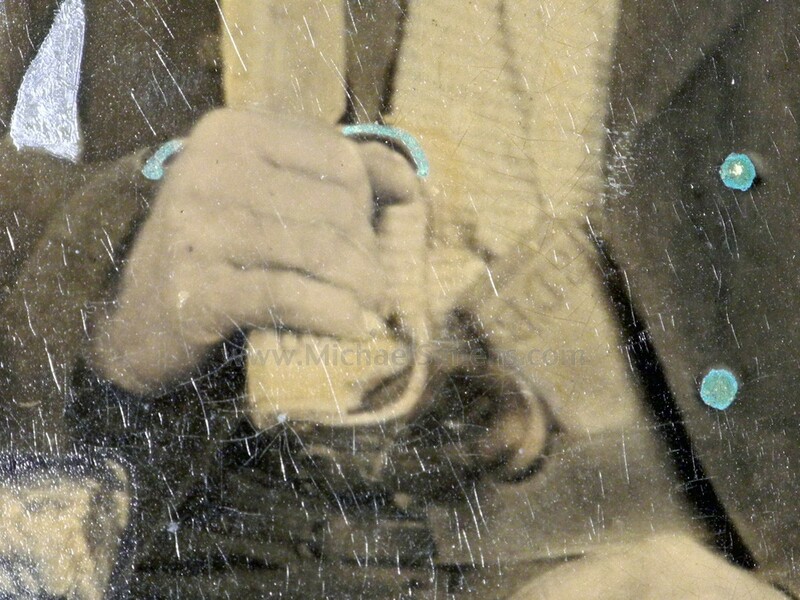 It appears the same initials are carved on the grip of his knife. My eyes are failing a bit, but they appear to be "B.D.B.". This one could be identifiable. 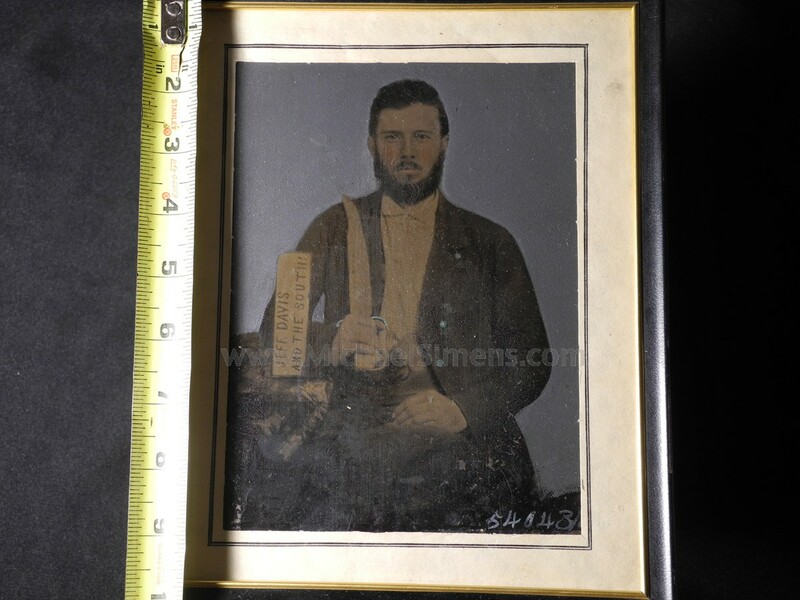 This image presents possibly the first and only opportunity for the collector to own one of these rarest of rare images that can actually be framed and mounted for viewing with the naked eye versus the usual "Hey honey, help me find my enormous magnifying glass so I can show my friends this great (but tiny) photograph" !